There is a street about two blocks from where I live called Walnut Avenue. It is one of the National Register Historic Places in Santa Cruz and it is lined with Victorian homes dating all the way back to 1870. I love to stroll through this area and enjoy all the beautiful houses with their intricate decor and nicely shaped gardens. These photos were taken in front of one of these houses but this particular one isn't as spectacular. I am definitely going back to take more photos in front of other houses soon, there are so much to see and so much to show! My vintage look was quite appropriate in this setting. 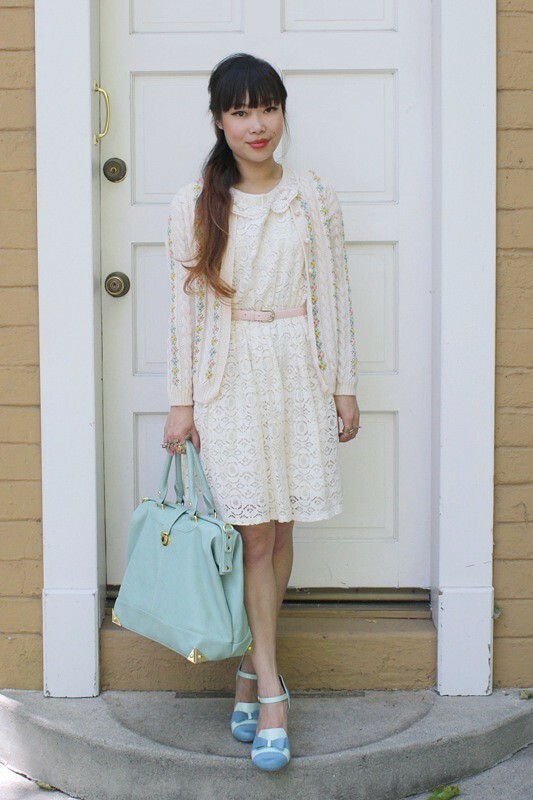 A vintage 1950s rosette wool cardigan over a peter pan collar lace dress, mint bag, and Dolly Mixture shoes gifted by Shellys London (thank you!!!). I absolutely adore these shoes! The soft mint and teal combo is so pretty, the bow is adorable, and oh my they are so comfortable too! Shellys London have so many cute shoes, I seriously want them all! 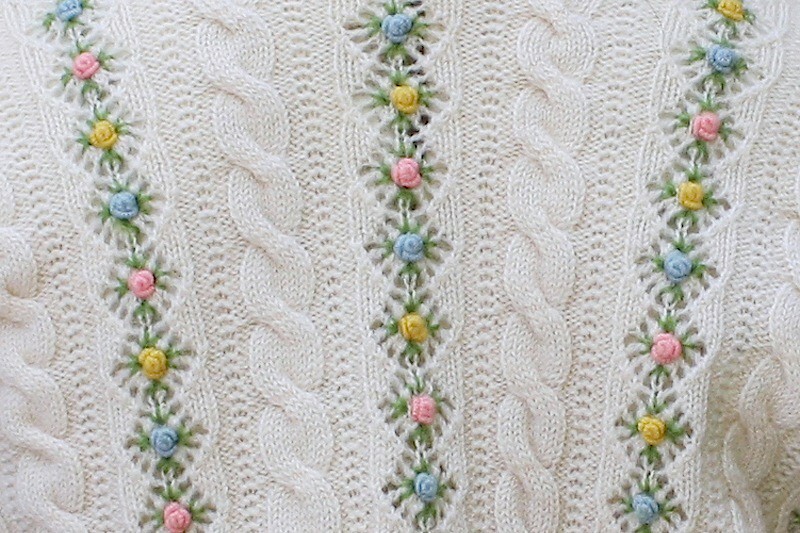 Vintage 1950s embroidered flowers wool cardigan by Cathay from Adelaide Homesewn. Peter pan collar lace dress from F21. Thrifted vintage pink leather belt. Mint bag from Nila Anthony from my work Sway. Dolly Mixture shoes c/o Shellys London. The whole look is gorgeous, and you wear it so well! The shoes are wonderful, and the bag is lovely, too! You look absolutly sweet! I feel transported back in time, it's just lovely vintage look! love this sweet vintage post. 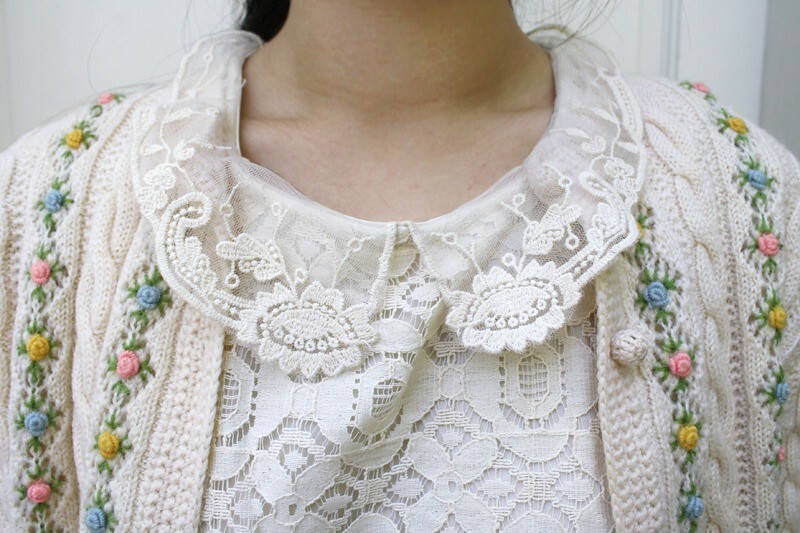 all the lace is so incredibly beautiful. so pretty and i love your shoes! Such a sweet outfit! Your blog is perfect!